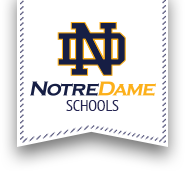 Notre Dame Elementary is a Pre-Kindergarten through Grade Six School. Our focus is a faith based education. We follow the New York State Common Core Curriculum, the Inter-diocesan curriculum goals established by the Archdiocese of New York, and the Syracuse Diocesan Religion Curriculum. Our Pre-Kindergarten programs include Universal Pre-K and modified Montessori. Our Kindergarten programs include a traditional Kindergarten Program and a modified Montessori. Music, Physical Education and Library are provided for all students in Pre-Kindergarten through Grade Six. Technology and Art are provided for students in Kindergarten through Grade Six. Spanish classes are in place for students in Grades Two through Six. STEM opportunities are integrated into all grade levels. Instrumental Music, Band, Choir, Altar Servers, Craft Club, Children of Mary Club, Sixth Grade Reading Club, No Bullying Club and Athletics are offered to interested students. Opportunities for student participation in liturgies and prayer services, service projects, and music concerts are available. Remedial Programs include AIS and Resource services provided by the Utica District, as well as Reading, Writing and Math coaching by NDE faculty.